Paul Barron is one of the food industries pioneers in the digital age of fast casual, social media and next-generation food media. As an award-winning author of The Chipotle Effect, documentary filmmaker and executive producer of Fast Casual Nation - Changing the way America eats, with over 20 years in food digital media, he is bridging the gap between the next generation food consumer and the future of foodservice professionals. His accolades include: 2019 Top 10 Foodservice Thought Leaders, 2018 #1 Most Influential in Food, 2018 Studio 50 Creative & Technologist Award Winner, 2017 Top 35 Restaurant Leaders to follow, 2016 Author of the year, 2015 James Beard Nominee, 2015 "Forbes" Top 50 Most Influential, 2012 Trendsetter of the Year, 2012 author of "The Chipotle Effect", founder of "Fastcasual.com", Food Documentary Film Festival Winner “Best Food Story” "Fast Casual Nation - Changing The Way America Eats." The key challenges any business of today faces is the connection to the right customer and the means and ways in which to do it. There are three key areas to understand the marketplace, the consumer and the competitive landscape. With over 20 years of digital consumer science expertise, our team takes your brand to an entirely new level. We help you understand where your business can go to connect to the shifting landscape of the digital consumer. Understanding today’s digital consumer is the most daunting issue facing any business executive. With our unique access to Foodable Labs the most comprehensive consumer social index available, we reach into the trends, minds and actions of a completely new consumer data set. We uncover the key elements that help you understand and identify your perfect customer. Once you understand where the market, competitors and consumers are heading the next major area to solve is your product market fit. This is more than just creating something you think might work, we develop a product strategy that can remap the way your business works to solve the issue of the evolving digital consumer landscape. Value Connection is not what you may think. Today it’s a whole new approach to understanding how your product connects to a value based consumer that has a new system of digital tools, word of mouth and behavior that cause them to buy your product or service. This means your value proposition changes in a big way, it surfaces as a new approach to the final connection to the digital consumer. We consult you on creating the Value Connection and most of all keeping it! The Chipotle Effect is the first book to identify and chronicle the emergence of a 70B restaurant segment in the making as lived by author Paul Barron the creator of the term Fast Casual. His mission was simple, tell the amazing stories of the people that were literally changing the very fabric of the American food culture and discover the reason the consumer landscape was migrating to this emerging restaurant scene - worldwide. The Book uncovers a new social science of the food consumer through the authors decade of research culminating to a full understanding of the digital consumer, which is next wave of consumers set to create more than 50 trillion in spending through 2030. It explores not only the reason consumers made the shift, but the technologies along with social media that developed a perfect storm for the consumer led fast casual movement. Social Media, the rise of the smart phone and the 2007 Economic Crises were the catalyst that build a new demand platform for food and very few restaurant operators understood the new rules. A first of its kind, Fast Casual Nation features the innovation and passion supporting the unparalleled growth of the Fast Casual restaurant business. The way America eats is changing. We want better options. We want better ingredients. We want better sourcing. We want better experiences. We want food with a story — and we want it fast. The last four decades of fast food is fading and now we're making room for a new culture of good food: fast casual. What is fast casual? 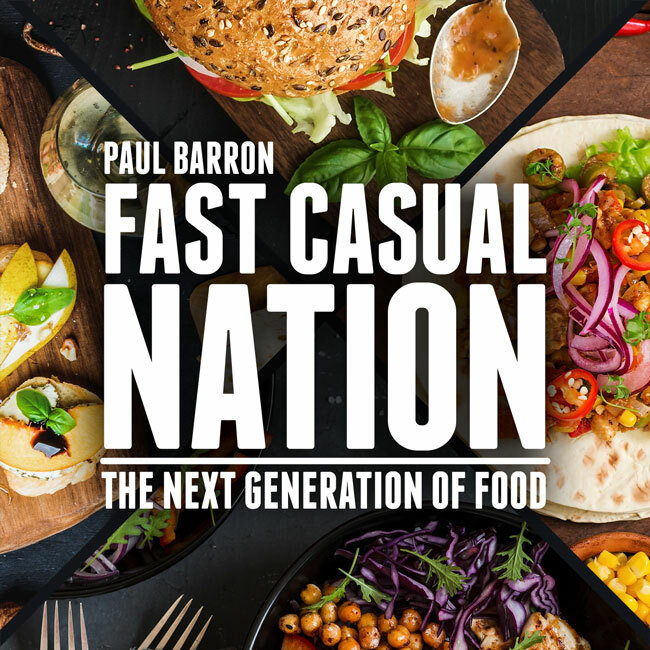 Follow Paul Barron, the pioneer who coined the term "fast casual" in 1993, in this documentary that has been 10 years in the making and dig into the stories of the iconic leaders and game-changers who are transforming the movement of our restaurants and the future of our food. Paul Barron started pioneering the fast casual segment in 1993, long before it became mainstream in 2003-2004. However, the fast casual darling, Chipotle only opened its first location outside Colorado in 1999. Since then fast casual chains have been rapidly on the rise. So far in 2014, DigitalCoCo tracked more than 600 fast casual brands and that is projected to increase to 700 by mid 2015. The potential for this segment seems limitless, with a restaurant industry accounting for 700 billion industry, fast casual currently only occupies 50 billion of that. With the fast casual concept changing and influencing the landscape of the entire restaurant industry, there is no better time than now to hold up a microscope and analyze the major players, trends, and influences in the segment. For over four decades fast food has consumed the American culture of food. That legacy has changed forever and the shift into an entirely new evolution of what good food fast, really means is driven by a completely new food consumer. This consumer is seeking more than just great food, they are looking for the aspect of sustainability, value based operations, and most importantly how the business and food connect to them. Consumers now are so much more aware of food origin and the people and stories behind the food. Fast Casual Nation is the journey and exploration of a new breed of restaurant and the food they serve. Join us as we explore this exciting new aspect of our food society through exclusive interviews from top chefs, restauranteurs and other industry insiders that provide you a close up look of "The Next Generation of Food". With over 20 years of consumer science in food and media, Paul offers one of the most comprehensive speaking and consulting programs for emerging restaurant brands, food brand and retail operations that are seeking to understand the impact of the new age consumer and how to connect to them better than your competitors. Tell us a little about what you need and Contact Paul now.